Mountains, represent the mountains of the municipality where the people used to hide from headhunters. Bamboo, represents the shield used by the people during sudden attacks. River, stands for Ikmin and Abas river. Mango and Rice Paddies, symbolize the agricultural products of the municipality which are the only source of income of the farmers. Sal-lapadan was the first Tinguian settlement organized under the American regime in the highlands of Abra. The municipality got its name from the barrio where the seat of government originally was. The original inhabitants named their settlement “Sahipa-chan”, the name of a wild bush which was predominant at the time in the area. During the Spanish period Sal-lapadan was a part of Bucay. When the Americans came, it becomes a separate district. 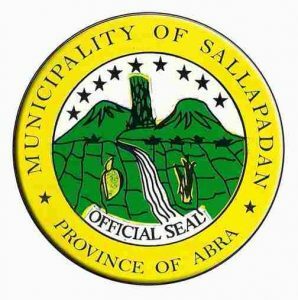 With the re-organization of Abra as a province in 1917, Sal-lapadan became a town occupying all the territories where the residents owned their land, like Abas and the lower parts of Bucloc. At the beginning of the reorganization of the town during the same year, its chief executives and councilors were elected for a three-year term. The presidencia or building housing the different local offices was located at Barrio Sal-lapadan. During the term of Guinaban Mustard, the presidencia was moved to Subusub. In 1931, during the term of Duquinal, it was relocated to its present site in Gangal (now Poblacion). When the government became a commonwealth, the term of office of the local chief executive was increased to four years. In 1939, the municipal hall was built during the term of Laguyan Brillantes. Brillantes also was the one who initiated the construction of the first piped-in water system of Sal-lapadan in1938. Beside the presidencia is a multipurpose building housing the office of the municipal circuit judge, the police headquarters, the municipal main health center, a multipurpose pavement, and an auditorium. It was constructed during the term of Martinez Saluquen and was funded by the Philippine Charity Sweepstakes Office. The public market was constructed during the terms of Alfredo Batoon and Gregorio Banawa. The municipal roads were constructed during the term of Balancad Mustard. At present, Sallapadan consists of nine barangays, namely: Gangal (Poblacion), Subusub, Maguyepyep, Bazar, Barrio Sallapadan, Ud-udiao, Bilabila, Naguilian, and Sac-caang. These barangays are grouped into three zones: Zone I – Bazar, Barrio Sallapadan, and Ud-udiao, Babila, Naguilian and Sac-caang. These barabgays are grouped into three zones: Zone I – Bazar, Barrio sal-lapadan and Ud-udiao:Zone II- Gangal (Poblacion), Subusub and Maguyepyep: Zone III- Sac-caang, Naguilian and Bilabila.